If you have guests that stay the night, where do they sleep? The sofa's always an option but it's not the most hospitable or comfortable choice. 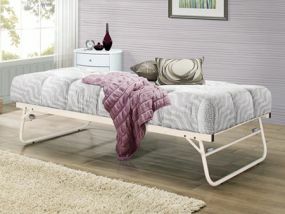 For a good value, practical and restful alternative, take a look at Birlea Furniture Single Guest Beds. The Birlea range includes options such as the Trundle Guest Bed, available in a choice of finishes, so you can choose which best suits your decor - because even if it's only for one night these things are important. The Birlea range also includes options in wood – either natural or painted – so you can be sure to find something that suits your décor. Some of the single guest beds also include a second mattress base stored beneath the main frame. This enables you to accommodate even more guests should the need arise, whilst tucking the mattress neatly away when not required.